ATLANTA — The Carter Center announced today eight U.S. recipients of the 2017-2018 Rosalynn Carter Fellowships for Mental Health Journalism. Selected from a pool of highly competitive applicants, the 21st annual class brings the total to 189 journalists who have been awarded the fellowships to date. (See below for a list of journalist names and project topics.) An announcement of the 2017-2018 fellowships to journalists from Colombia, Qatar, and The United Arab Emirates will be made in August 2017. Mental illness and substance use conditions are among the most common health conditions in the world, yet sensationalized news coverage or underreporting of these issues can perpetuate myths and misconceptions and discourage people from seeking effective treatment. Carter Center fellows receive intensive training from leading mental health and journalism experts and a $10,000 stipend (or a comparable amount for international fellows) to report on a mental health topic of their choice. The fellowship program challenges recipients to delve deeper into learning about a mental health issue of interest to ensure the general public is provided with reliable information about mental illnesses. 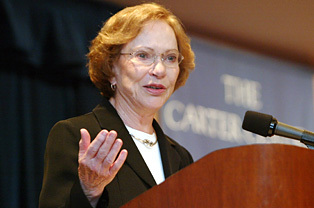 Over the history of the program, Rosalynn Carter fellows have produced more than 1,500 mental health-related stories: eight books in conjunction with the fellowship; five documentary films; hundreds of newspaper, magazine, and online pieces; multiple hours of radio and television airtime; and innovative uses of multi-media. Former fellows have been nominated for the Pulitzer Prize and won Emmy and Peabody Awards for their fellowship projects. The fellowship program is part of the Carter Center’s Mental Health Program, which works around the world to improve access to mental health care and reduce stigma and discrimination against people with mental illnesses. Topic: Illuminate the mental health costs of the ongoing Illinois budget stalemate and the difficult work of Illinoisans who have tried to stanch the damage. Topic: Explore the issues of trauma and mental health intertwined with the potential for peacebuilding in the aftermath of Boko Haram. Topic: Explore whether a mental health model of using medication-assisted treatment and counseling can help save the drug-ravaged Badlands of Philadelphia. Topic: A radio project examining Alaska-specific solutions for preventing and treating mental illnesses. Topic: Write her second memoir, “Sheba, Dark and Lovely,” which looks at a parent’s chronic mental illness and aging. Topic: Examine the needs of children struggling with depression, anxiety, and other mental health disorders, as well as the potential solutions. Topic: Tell the stories – in their own words – of how low-income women access care for perinatal mood disorders; examine policies related to depression screening for pregnant people and evaluate programmatic solutions.